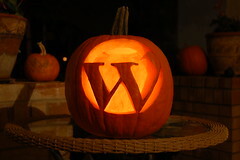 Tired of carving the same 'ol pumpkin every year, I thought I'd try something different this year. 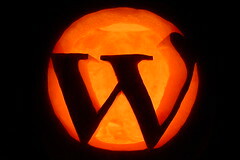 I free-handed the WordPress logo on the pumpkin then carefully carved it out. 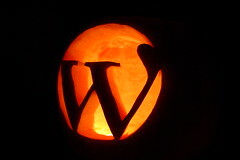 WordPress Pumpkin set on Flickr. Yesterday, on September 24, I turned 34! Which means I was born in 1974. What do all of those have in common...4. - My sons, Caden and Cooper, are 3 and 4, respectively. - Kirby Puckett, one of my childhood "idols" wore number 34. This isn't a new topic, but I had the need to create a custom jQuery selector today, so I thought I'd share. Whether you are a jQuery newbie or seasoned pro, you know that jQuery has very powerful selectors. In addition to the class and id selectors, there are over 30 selection expressions that use the colon syntax (:first, :even, :hidden, :input, etc.). 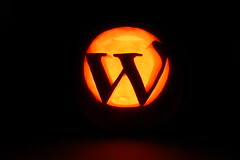 If one of the existing selectors doesn't fit your needs, jQuery provides you the flexibility to create your own!